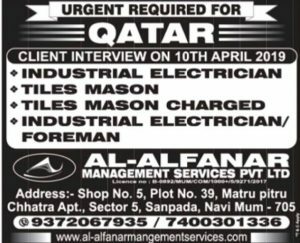 The post URGENT REQUIRED FOR QATAR appeared first on Gulf Job Walkins 2018- Gulf Job Walking Vacancy. The post WALK IN INTERVIEW IN DELHI 2019 appeared first on Gulf Job Walkins 2018- Gulf Job Walking Vacancy. 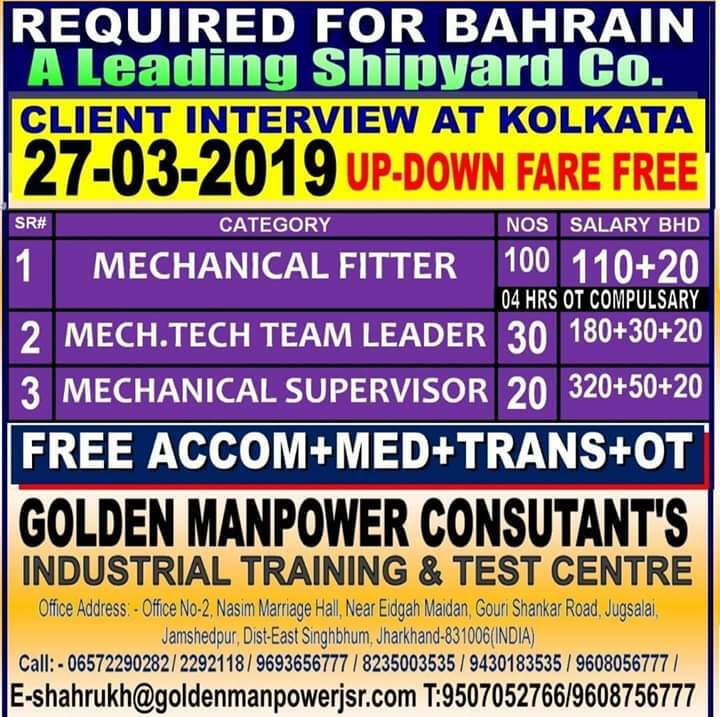 Check Today rk international delhi interview 2019.Here we update day by day gulf job vacancies from rk international delhi interview 2019 latest posts. 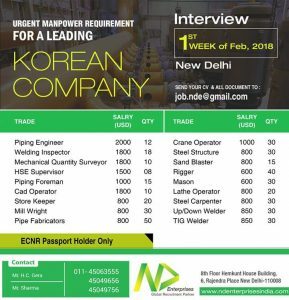 Kiln Operator – 20 vacancies Salary Offered up-to 1800-2000, 12th pass/trade Certificate / electrical background preferred with 5 Years Exp in tunnel kiln operation in any Ceramic plant. Store Keeper 16 vacancies Salary Offered up to 1800-2000 Graduate / minimum 12th pass 5 years Exp as a Storekeeper Computer literate. Oracle knowledge. AC Mechanic 12 vacancies are available Salary Offered 1800-200, ITI Pass / Trade Certificate with 5 years Exp in repairing of all types of Air Conditioners. Office Account clerk 8 vacancies are Available Salary offered up to 1800-2000 Bcom Computer literate English / Arabic typing Skill, Oracle knw 5 years working exp in any type. Maintenance Supervisor 18 vacancies are available 2800-3000 Diploma with 7 yrs Exp able to diagnose, trouble Shooting of problem able to overhaul gearbox, pumps, valves (Hyd & pneumatic), independently able to read hyd & Ability to Speak English. Senior Maintenance Fitter 12 Vacancies Salary offered up to 2000-2300 Trade Certificate / with 5 Years Exp able to diagnose trouble Shooting of problem able to overhaul gear box, pumps valves ( Hyd & pneumatic) independent able to read hyd & pneumatic Circuits. 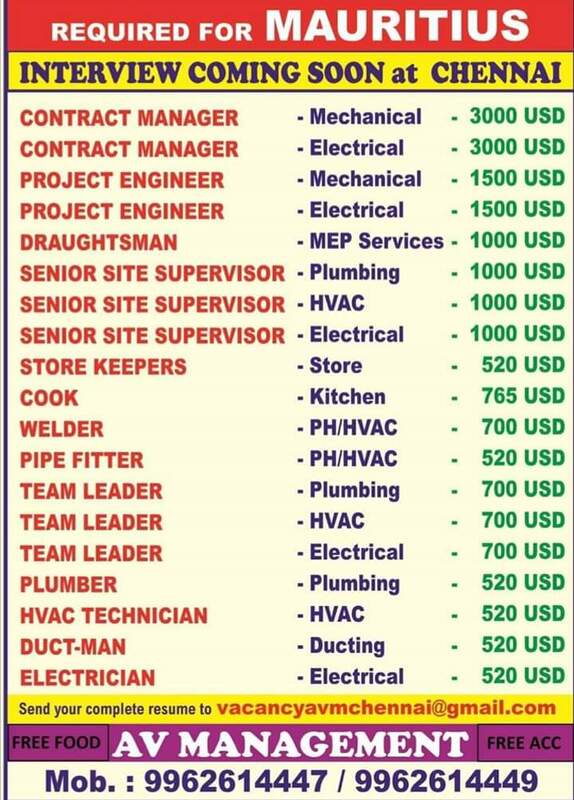 Plumber 10 vacancies Salary 1800-2000. Trade certificate / with 5 Years Exp of various plumbing Job. 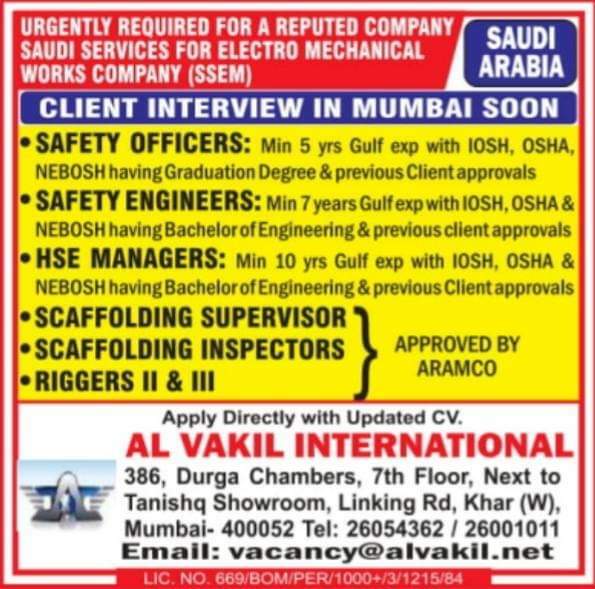 Electrical Supervisor 16 vacancies are available Salary offered Up to 2300-2500 diploma with 7 years Exp able to diagnose trouble Shooting of problems Ability to read Electrical / electronic diagrams & circuits Ability to Speak read & write English. Heavy Vehicle Driver 18 vacancies Salary offered up to 1800-2000 10th pass Sudi Heavy Driving License holder with 3-5 years Exp. 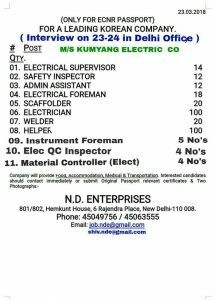 Senior Maintenance Electrical 40 vacancies are available Salary offered up to 2200-2500 IT Pass/trade Certificate 5 Years of Exp. Terms & Conditions: Medical Accommodation & Transportation Provided by the company. All other terms & Conditions as per Saudi labor law. Duty 08 per day 06 Days per week. Hiring for multiple positions at Bahrain. Client Interview will be held on this month,2017. Urgently Required For A Leading Oil & Gas Contracting Company. Post Names: 6G Welders – TIG + ARC, 6G Welders – ARC, Sand Blasters. Applicants must have 5-7 years with running card in Oil & Gas/ Refineries / Petrochemical Projects.2 years renewable contract. Report with original passport,complete bio-data and 2 photos. The interviews for Gulf Jobs are conducted at different locations in India regularly. The candidates can walk-in with their relevant documents and updated CV’s. The post URGENTLY REQUIRED FOR A REPUTED COMPANY SAUDI SERVICES FOR ELECTRO MECHANICAL WORKS COMPANY (SSEM) appeared first on Gulf Job Walkins 2018- Gulf Job Walking Vacancy. The post URGENTLY RECRUITMENT FOR KUWAIT appeared first on Gulf Job Walkins 2018- Gulf Job Walking Vacancy. Testing of panels , relays , meters etc. Poonamallee Road, Ayyappanthangal, Chennai 600 056. The post URGENTLY RECRUITMENT FOR QATAR appeared first on Gulf Job Walkins 2018- Gulf Job Walking Vacancy. The post A Leading Shipyard Co required for BAHRAIN appeared first on Gulf Job Walkins 2018- Gulf Job Walking Vacancy. 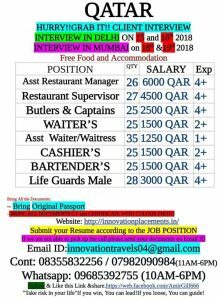 The post REQUIRED FOR MAURITIUS appeared first on Gulf Job Walkins 2018- Gulf Job Walking Vacancy. The post A Prestigious Luxuary Car Dealership in BAHRAIN appeared first on Gulf Job Walkins 2018- Gulf Job Walking Vacancy. The post Urgently required for leading Tea manufacturing company appeared first on Gulf Job Walkins 2018- Gulf Job Walking Vacancy. Work on complexprojects and change requests, from creation to resolution. Produce and promote internal standards and bestpractice for WordPress and PHP platforms. management to resolve potential delays/issues. Participate in QC checking for department work. The post URGENT REQUIREMENT for QATAR HIRING appeared first on Gulf Job Walkins 2018- Gulf Job Walking Vacancy.